Background: Approximately 40,000 tonnes of eucalypt bark residue are produced by North Forests each year, posing a significant waste issue. Conversely, concern has been expressed over the continual loss of organic matter from intensively cultivated cropping soils on the North West Coast of Tasmania, leading to poor soil structure. This project is investigating whether bark residue could be beneficially employed in vegetable soils. 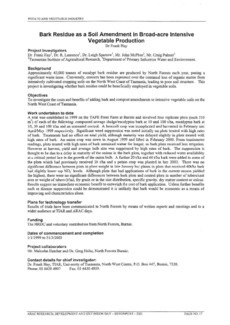 Objectives: To investigate the costs and benefits of adding bark and compost amendments to intensive vegetable soils on the North West Coast of Tasmania. Work undertaken to date: A trial was established in 1999 on the TAFE Freer Farm at Burnie and involved four replicate plots (each 210 m2) of each of the following: composted sewage sludge/eucalyptus bark at 10 and 100 t/ha, eucalyptus bark at 10, 50 and 100 t!ha and an untreated control. A broccoli crop was transplanted and harvested in February and April/May 1999 respectively. Significant weed suppression was noted initially on plots treated with high rates of bark. Treatments had no effect on total yield, although maturity was delayed slightly in plots treated with high rates of bark. An onion crop was sown in August 1999 and lifted in February 2000. From tensiometer readings, plots treated with high rates of bark remained wetter for longer, so bark plots received less irrigation. However at harvest, yield and average bulb size was suppressed by high rates of bark. The suppression is thought to be due to a delay in maturity of the onions in the bark plots, together with reduced water availability at a critical period late in the growth of the onion bulb. A further 20 t/ha and 40 t/ha bark were added to some of the plots which had previously received 10 t/ha and a potato crop was planted in late 2000. There was no significant difference between plots in plant weight in late January but plants in plots that received 40t/ha bark had slightly lower sap NO3- levels. Although plots that had applications of bark in the current season yielded the highest, there were no significant differences between bark plots and control plots in number of tubers/unit area or weight of tubers (t/ha), fry grade or in the size distribution, specific gravity, dry matter content or colour. Results suggest no immediate economic benefit to outweigh the cost of bark application. Unless further benefits such as disease suppression could be demonstrated it is unlikely that bark would be economic as a means of improving soil characteristics alone.